Microsoft announced the release of four new edX online training courses for Microsoft Exchange Server 2016. If you plan to implement Exchange Server 2016 or Exchange Online, or if you want to make sure that your implementation was done right, the Exchange Server 2016 online training courses are for you. CLD208.1x: Microsoft Exchange Server 2016 Infrastructure—Learn how to plan, configure and manage Active Directory infrastructure requirements for Microsoft Exchange Server 2016. CLD208.2x: Microsoft Exchange Server 2016 Client Access Services—Find out how to plan and implement mobile messaging, Outlook and secure Internet access to improve client access services. CLD208.3x: Microsoft Exchange Server 2016 Mailbox Databases—Get the details on planning and configuring mailbox databases, including backup, recovery and restoration. CLD208.4x: Microsoft Exchange Server 2016 Transport Services—Explore planning and configuring message transport services, including antivirus, malware detection and spam-filtering solutions. Each Exchange course is targeted to the IT professional audience, with hands-on labs that reinforce student learning. Students are graded on completing each module, as well as on module assessment exams and a final course exam. A Certificate can be earned by completing each course with a passing grade. Courses are self-paced, allowing IT professionals to build Exchange skills at their own pace as their schedules permit. The first course, CLD208.1x: Microsoft Exchange Server 2016 Infrastructure, is free. The remaining three courses are for-fee courses at $49 USD per course. edX is a massive open online course (MOOC) provider that was developed by MIT and Harvard University. The Microsoft Learning Experiences team has created a wide range of online training courses for edX, and these four Exchange courses are the team’s latest Office releases. They are the first of seven courses that cover the core skills an Exchange administrator needs to proficiently design, implement and manage an Exchange 2016 and Exchange Online implementation. 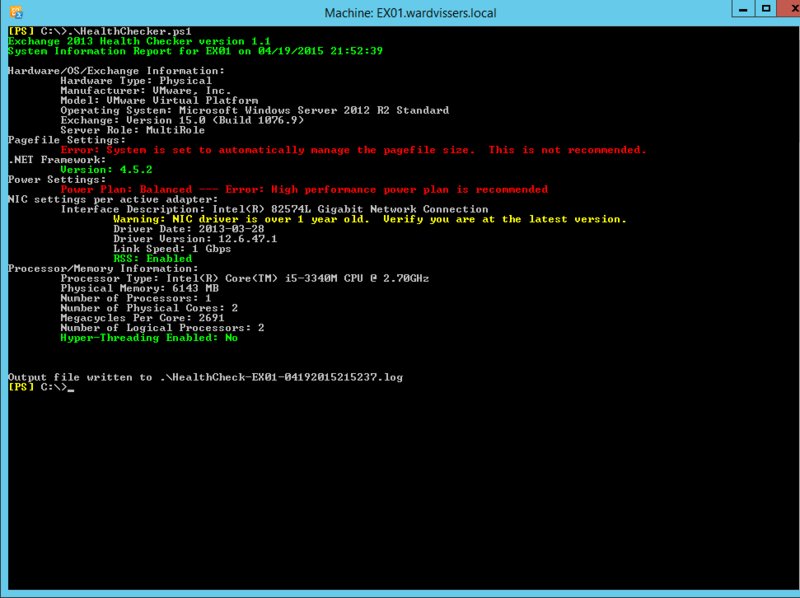 This script will install the needed prerequisites for the Mailbox Role of Exchange 2016 “Preview” on Server 2012 R2 . This script checks various configuration items on the server to make sure they match the recommendations published in the “Exchange 2013 Sizing and Configuration Recommendations” guidance on TechNet. It also reports on OS, system, and hardware information. It can be ran remotely, against a single server or a group of servers. It takes some of the most common configuration causes of Exchange 2013 performance cases that we encounter in support and allows you to rule them out quickly without having to check each server or read through the entire TechNet guidance. This script needs to be executed from the Exchange 2013 Management Shell. On vInfo tabpage new field quest state. On vNetwork tabpage new field VM folder.